For the left-handed shooter, aligning the sights and pressing the trigger may look like a mirror-image activity of a right-handed shooter, and physically it may be, but psychologically… well, we’ll get into that later. 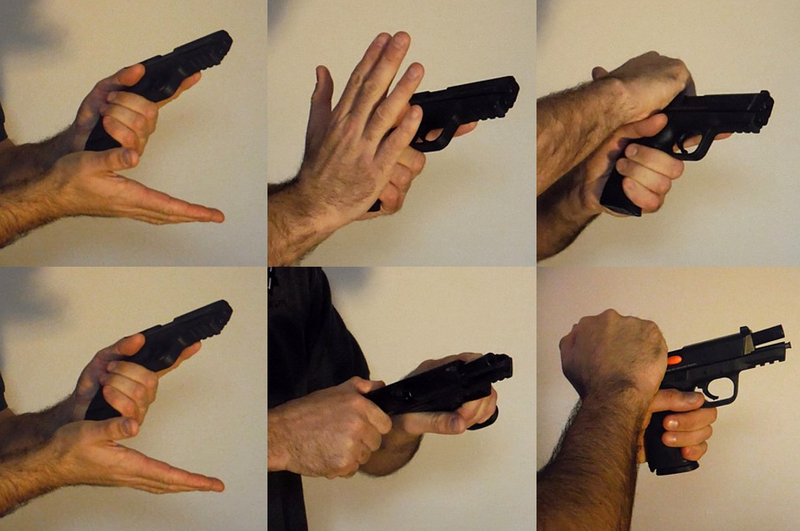 The physical firearms manipulations preceding and following the actual act of shooting, however, can be significantly different for the southpaw marksman depending on the type of firearm used. 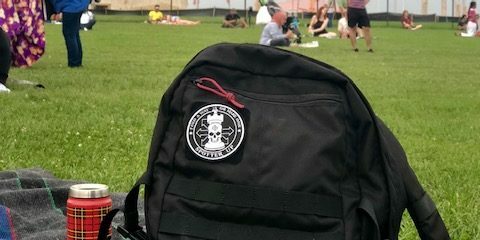 At the time of this writing, I have been a firearms instructor for about 7 years, but I have been a recreational and competitive shooter for over 30 years. For almost 20 years I have worked as a full-time industrial safety professional, which has afforded me a great deal of experience with ergonomics and particularly the ergonomics of hand tools. More appropriate to this article, I have spent almost 4 decades experiencing the full benefits and challenges of living left-handed. Most generalizations about the natural affects of brain lateralization, such as that old doggerel about “lefties being in their right mind,” are overstated. Nurture seems to cause more psychological differences in lefties than nature, and the process of forced conversion, forcing lefties to be righties, often creates some not so nice side-effects. What’s that you say? Lefties are not persecuted or discriminated against anymore? 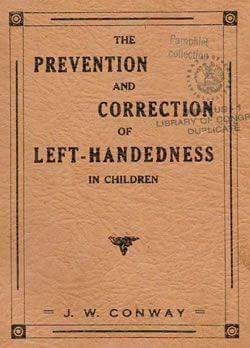 Ahem… my own experience with left-handedness in grade school in the 1970’s indicated that one could still be persecuted for being left-handed, though the severity of punishment was somewhat reduced. 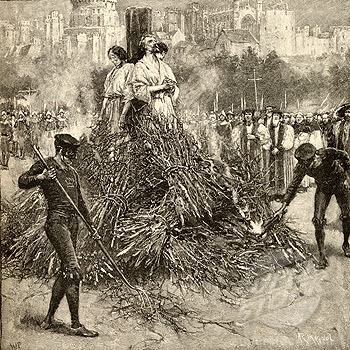 Fire codes had thankfully made the more gruesome aspects of auto-de-fé impractical, but the root of the practice, public humiliation, was still alive and well. Other punishments were more subtle, such as the physical impediments imposed by a society that favors “dexterity” versus “sinistrality.” For example: student desks were especially suited for right-handers, standardized tests are still designed to be filled out with the right hand, and I have all kinds of fun memories from the nuns forcing me to use the right-handed scissors, and what would happen in moments of forgetfulness or frustration when I would revert to my left hand. In general, being a lefty was treated as if it was a dirty habit that needed to be stamped out. These factors usually resulted in my work being hidden in a drawer, rather than displayed on the wall like that of my right-handed classmates, and had me convinced that I had no artistic talent, at least until an art teacher in high schooled (also a lefty) showed me otherwise. 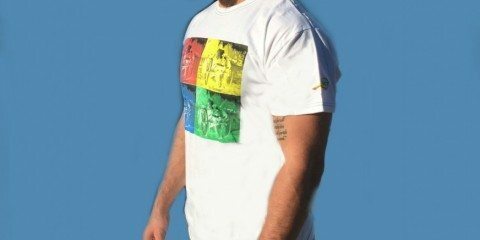 But I’m not bitter or anything, really… Fortunately for us lefties, that approximately 13% of the population that is still one of the most discriminated against on the planet, we are great adapters. Our persistence and ingenuity enables us to survive, if not thrive, in this hostile environment where everything from our language, to common tools, the vehicles we drive, our technology and our weaponry favor the right-handed majority. 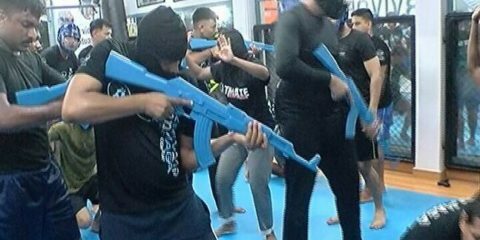 Ok… enough whining; let’s talk about firearms manipulations. 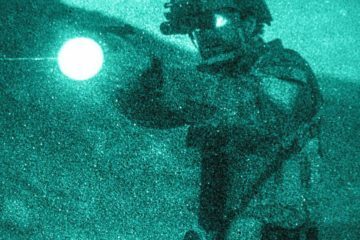 These tips aren’t just for southpaws, you righties out there who practice left-handed firearms manipulations can benefit from these as well. No matter what hand you use to shoot with, there are several good reasons why firearms with a lot of extra bells and whistles like manual safeties and decockers are a less desirable option for defensive or concealed carry use, unless you are a particularly dedicated practitioner. 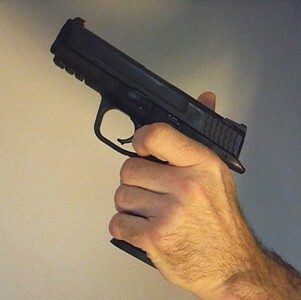 Any firearms that have to be carried “cocked-and-locked,” such as the standard 1911 or Browning Hi-Power, require thumb deactivation of the manual safety on the draw and presentation. There are certainly folks who can do this and who do it well, (most of them right-handed), but the majority of concealed carry folks don’t put in the number of reps at the range to make these behaviors automatic. 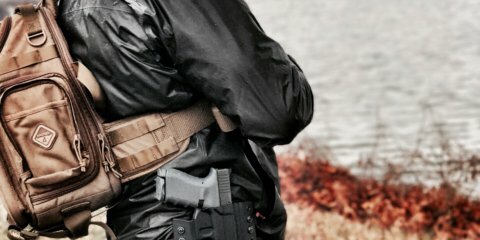 If you carry a firearm like a Glock or an M&P (just 2 examples), congratulations, these handguns are about as simple and bilaterally functional as it gets. So let’s start with left-handed manipulations of these 2 firearms, which I select because they are the two most popular and viable defensive firearms available today. There are only 4 controls on the basic models: trigger, slide, slide lock, and magazine release. I don’t want to get down the rabbit-hole on models with thumb-safeties, magazine safeties and trigger locks. Such “safety features,” in my opinion as a career safety professional, are mechanical answers for behavioral problems that are ultimately unnecessary and undesirable on defensive handguns. The trigger is usually symmetrical and placed in the center of the firearm for ease of use with either hand. As long as you have correct trigger finger contact and press carefully in line with the bore, the trigger seems to have no left/right preference. So far, so good. The slide is essentially bilateral in nature on almost all semi-automatic pistols, the exception being that the ejection typically favors the dexterous. *Notice that I don’t use the term “ambidextrous” in this article, the etymology of which actually means “both right” as in “two right hands.” Words are important. I don’t have 2 right hands, though I have been accused of having two left feet. “Bilateral” is a term that means “two sided,” and is linguistically more apt for our purposes. …grips and runs the slide while the firearm is pushed in the direction of the target (where it can be fired with one-hand if necessary) and the right hand can establish a support grip if necessary. …while a few of the modern isosceles guys, as well as “Israeli style” shooters favor a “lateral pinch” (slingshot) technique. ...then rotates the gun hand almost 180-degrees to bring the slide into position where it can be grasped. 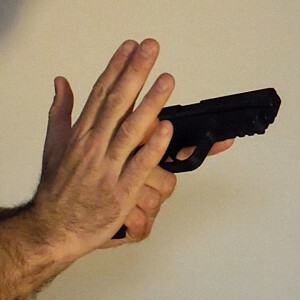 Pinch and run the slide, then rotate the gun 45-degrees in the opposite direction while presenting toward target, obtaining a support hand grip if desired. Despite these manipulations, the timer indicates that this is slightly faster than the palmar grip technique – for me. 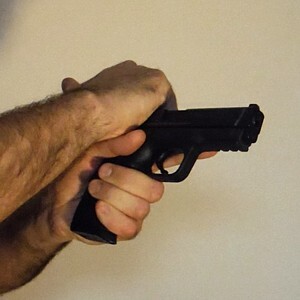 I am aware of three reasons for preferring the lateral pinch over the palmar grip technique: first, and most common, is the risk of pinching the hand between the slide and breech face of the barrel. This happens primarily to inexperienced firearms handlers because they ride the slide forward. Training can easily correct this problem. There is also a risk of obstructing the ejection port with the fingers and inducing a malfunction. For lefties, the risk of this is potentially greater because we place the widest portion of the hand on the ejection side. Lastly, should we be ejecting a live round and experience the oddball out of battery discharge that can result from the primer impinging on something pointy like the ejector or extractor, our wrist and radial artery is right where we don’t want it – if we want to avoid it catching a bunch of sharp case fragments that is. Department of Labor measurements of “lateral pinch” (thumb to side of forefinger) grip strength indicate 16.5 pounds of force is the approximate average for males and 11 pounds of force is the approximate average for females. These numbers, of course, vary with age, occupation, and other conditions such as arthritis. Contrast this with measurements of “palmar grip” strength which show approximate average gripping forces of 28 lbs for men and 20 lbs for women, over 40% stronger than a “lateral pinch.” This is due to the greater leverage of the longer flexor digitorum muscles responsible for gripping with the fingers, compared to the shorter flexor pollicis longus muscle responsible for pinching with the thumb. So the “over the top” guys win the muscular grip strength argument; there is measurably more strength in running your flipper over the top of the slide than there is pinching it between your thumb and index finger. The factory recoil spring on a 9mm M&P is 16 pounds, 17 pounds on a 9mm Glock. Without getting into the details of calculating the normal force necessary in direction X to overcome the coefficient of friction of the slide to apply 17 pounds of tangential force in direction Y, let’s just say that a larger percentage of shooters have the physical strength necessary to run a slide “over the top” than do with the “slingshot” method. I suppose it is fair to ask whether the extra strength is really necessary, as plenty of shooters are able to run the slide with a lateral pinch grip, but if we are looking for a technique that works reliably for the greatest number of people, a palmar grip offers more actual strength. There is the gross vs. fine motor skills argument to think of as well. One of the first physical movements we make when we come out of the womb is an instinctive palmar grasp. This is as gross motor movement as it gets. The pincer grasp (thumb and forefinger pinch) is one of the first fine motor skills we develop. So… the drawbacks of the palmar grip are that it is marginally slower and there is a possibility of getting pinched or causing a malfunction, (both of which can be corrected by training and practice), or of getting injured by case fragments due to an out of battery discharge, which is thankfully a rare occurrence. 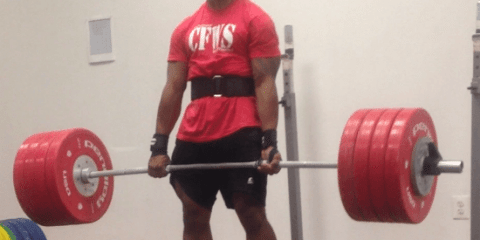 The advantages are strength, simplicity, more physical contact with the slide, and biomechanical advantage that allows it to work for practically everyone. The drawbacks of the lateral pinch are that it relies on one muscle instead of a group of muscles to do the work. 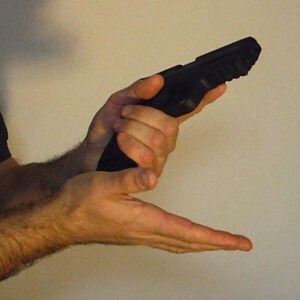 It lacks surface contact with the firearm which could be an impediment if the gun gets slippery, and since almost all of the schools out there teach the palmar grip method, you will probably run into instructors who insist on explaining to you why the other way is better all of the time. The advantages are a slight speed edge, (which can be shooter specific), and reduced risk of inducing a malfunction due to blocking the ejection, or getting injured by an out-of-battery discharge during slide manipulation. At the end of the day it’s your choice, but for lefties who can manage it, there seems to be a slight advantage to the lateral pinch over a palmar grip, but with training and practice they both work. Whichever you decide, however, I strongly recommend you pick your primary method and stick with it. The slide lock is bilateral on the M&P, but not the Glock. Activating the slide lock on the M&P is as easy as pushing it up with the left thumb while retracting the slide. On a Glock or other handgun with a dexterous-only slide lock, lefties need to use the right hand thumb to manipulate the slide lock while retracting the slide with the right hand in a reverse palmar grip. This is only safe with a pistol that has already been cleared, because it results in the right fingers overlapping the ejection port which is NOT what you want to do with any ammunition in the firearm. If you are attempting this one-handed, it is quite a rodeo and I haven’t yet found a good method for making it work without sacrificing the firing grip on the gun, which is inadvisable. 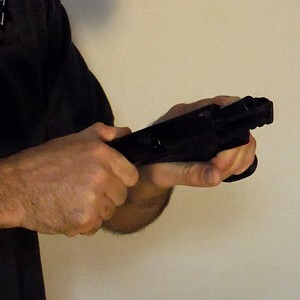 The magazine releases on both the M&P and the Glock are specific to the right-handed majority, designed to be manipulated by the right thumb, but that’s OK… our left index or trigger finger is strong enough to press the magazine release button and is conveniently placed to perform this task. 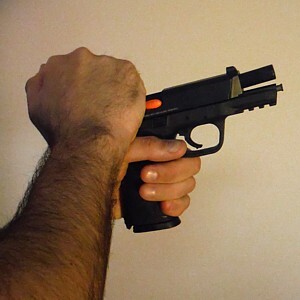 Unlike our right-handed brethren who have to concentrate more carefully on keeping the trigger finger out of the trigger guard to prevent activating the trigger unintentionally during this manipulation, using the trigger finger to hit the mag release button eliminates this problem for us southpaws automatically. 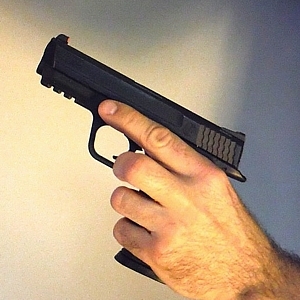 I have observed that there is a tendency for some to want to use the middle finger to activate the magazine release button, but doing so reduces the number of fingers actually gripping the firearm, which means a reduction in physical contact, therefore control, and risks sympathetic finger motion which could cause the index finger to come into contact with the trigger while performing this manipulation. This could cause a negligent discharge during a tactical reload, so obviously that is a behavior we want to avoid. I do NOT recommend using the middle finger for this purpose. Although it feels awkward at first, using the left index finger to press the magazine release button provides more control over the handgun. Many left-handed shooters, myself included, find it easier to use the paddle-style magazine release found on H&K’s and some Walthers. My primary concealed carry handgun for over 5 years was a Walther P99 – until relatively recently when I switched to the M&P. Some pistols also give the option of switching the magazine release button to the right side of the handgun so we can manipulate it with the left thumb. 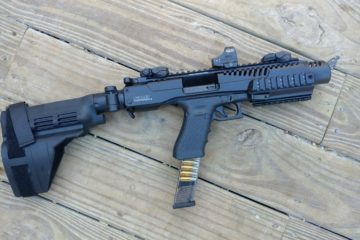 I advise not making this modification, and stress practicing manipulation of the standard magazine release. Why? Because there’s no guarantee you will be in a gunfight with your firearm and you don’t want muscle memory to cause you delay and confusion under stress looking for a control that isn’t there. 1. Tap – use the palm of the right hand to tap the magazine firmly to ensure it is fully seated. 2. 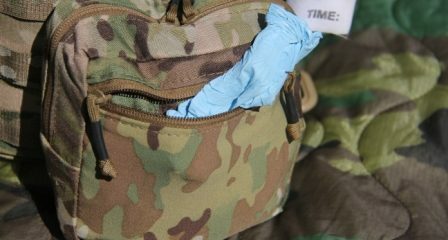 Rack – use the right hand to run the slide hard, which will clear the breach of stovepipes or failures to feed and simultaneously reload the pistol. As a lefty, whether we use the palmar grip or lateral pinch, we naturally angle the ejection port of the pistol slightly downward, which is a good thing; it takes advantage of gravity and helps any junk fall out of the ejection port. 3. Unload/Reload – If it is a double feed, the top round in the magazine gets pinched by the slide and prevents it from dropping free when we press the mag release. 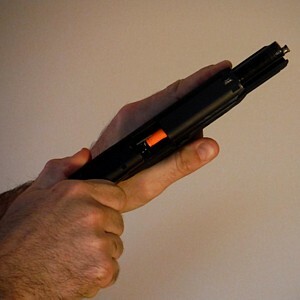 Some folks advocate locking the slide back before clearing this type of malfunction but if you have to manipulate the pistol primarily with your left hand, and especially if you have to manipulate it with the left hand only, and particularly if you have a Glock or firearm without a bilateral slide lock…that won’t work. We don’t have time to mess with this in an emergency so skip locking the slide. Hit the mag release, hook the magazine base plate with your right hand fingers, and pull hard to strip it out of the gun. Better hope you don’t rip the base plate off the magazine body in the process because that would be bad. For this reason, I dislike those angled rubber skid plates on magazines because they give you no lip or edge to hook on anything. In any case, once you strip out the mag, run the slide three times hard, stick in a new mag if you have one, or reinsert the original mag if necessary, run the slide again to load the firearm and get it back in the fight. Next Chapter: malfunctions and manipulations with the sinister hand only. 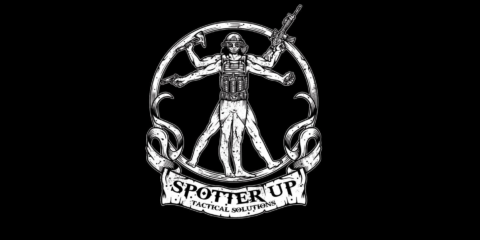 This article was originally written for Adaptive Defense Concepts in February 2014, and is republished here on Spotter Up Tactical by the original author. Why Are You Running If You Don’t Have a Training Purpose? 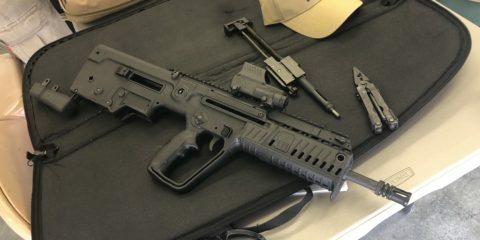 The KPOS Pathfinder – The Ultimate Truck Gun Option?